Professor Elizabeth Lyding Will (1924 - 2009, obituary here) was one of the world's leading authorities on amphoras, an ancient two-handled container that her research demonstrated to be vitally important for tracing ancient trade patterns and for opening windows on tremendous amounts of information about ancient life and commerce. 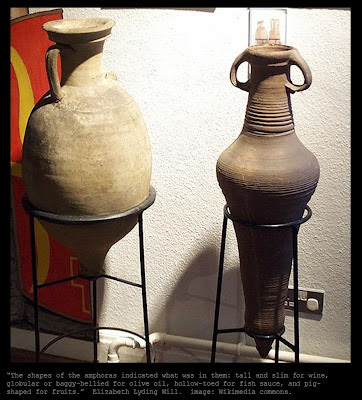 In a 2000 article entitled "The Roman Amphora: learning from storage jars," she discusses the diverse uses of "the lowly Roman amphora—a two-handled clay jar used by the Canaanites, Phoenicians, Greeks and Romans to ship goods," describing both its main usage for the transportation of liquids including wine, olive oil, and fish sauce, and its many other auxiliary uses, from funerary urn to acoustic enhancement device in theaters. It makes fascinating reading, but the most intriguing aspect of the article, perhaps, comes in the final paragraph, in which Professor Lyding states that she has in her possession a fragment from one of the controversial amphoras found in Guanabara Bay outside of Rio de Janeiro, Brazil, and that she believes its characteristics may indicate a date of the third century AD. This 1985 article from the New York Times explains that the bay is littered with shipwrecks, but that a particular submerged reef within the bay is known for the ancient jars that local fishermen have reported hauling up in their nets for years (hence the informal moniker, "Bay of Jars"). In the 1970s, the article reports, "a Brazilian diver brought up two complete jars with twin handles, tapering at the bottom, the kind that ancient Mediterranean peoples widely used for storage and are known as amphoras." This piqued the interest of Florida author Robert Marx, who obtained permission to dive at the site in late 1982, and found the remains of over 200 broken amphoras as well as several complete amphoras. However, the article goes on to explain that Mr. Marx alleges that the Brazilian Navy abruptly rescinded his permission to dive after these artifacts were brought up, because (in the words of the article's author): "proof of a Roman presence would require Brazil to rewrite its recorded history, which has the Portuguese navigator Pedro Alvares Cabral discovering the country in 1500." He says that officials of the Brazilian government told him, ''Brazilians don't care about the past. And they don't want to replace Cabral as the discoverer.'' The Brazilian Navy then dumped masses of silt over the site of the wreck and buried the remaining amphoras, according to Mr. Marx. This article from the site "rogueclassicism" argues that the amphoras found in Brazil should not be taken as conclusive proof of ancient trans-Atlantic commerce (or even an ancient accidental crossing), casting doubt on the credibility of Mr. Marx as well as pointing out that "that amphorae were used by the Spanish in the 15th, 16th, and 17th centuries to transport olive oil (and other purposes, I would imagine)!" thus raising the possibility that the amphoras in question might have been lost in the bay much later than the ancient era. While this possibility should certainly be examined, the analysis of Dr. Will, one of the foremost authorities on amphoras and their dating, should certainly carry significant weight. It is mere speculation to argue that these amphoras could be from the 15th, 16th or 17th centuries, while Dr. Will's opinion was based on actual examination of artifacts and her very extensive experience. Nevertheless, it is important to note that the possibility of ancient trans-oceanic contact should never be pinned on any single artifact or "data point." The fact is, there is an enormous pile of evidence pointing to ongoing ancient crossing of the oceans -- there are literally thousands of data points in addition to these particular amphoras. A list of some of the others can be found in this previous blog post. Regarding amphoras, it also appears that the amphoras found near Rio are not alone: David Hatcher Childress reports in Lost Cities of North & Central America that "A Carthaginian shipwreck containing a cargo of amphorae was discovered in 1972 off the coast of Honduras" (15). The possibility that amphoras and shipwrecks found in the Americas might be of Phoenician origin rather than necessarily of Roman origin is significant. Note that in the first quotation from Professor Will cited at the top of this blog post, she describes an amphora as "a two-handled clay jar used by the Canaanites, Phoenicians, Greeks and Romans to ship goods." This excellent discussion of ancient Roman wine and viticulture (from the University of Chicago) explains that the Romans appear to have learned about growing wine grapes and making wine from the Phoenicians (or at least from their captured texts on how to do it). The same website also contains some discussion of amphoras, along with a photograph and a diagram of various amphora shapes. That site declares that "The replacement of amphorae, which were airtight, by wooden barrels in the second century AD meant that vintage wines would not reappear until the seventeenth century, with the development of the glass bottle and cork." Amphoras, then, are extremely important artifacts. The fact that ancient amphoras may have been found under the waters off the coastline of the Americas is hardly well-known among the general population, but it is yet another important clue pointing to the fact that ancient civilizations were capable of far more than we give them credit for. Have you been watching retrograde Mars? What kind of music gives you chills? We're busting into undisturbed Lake Vostok why?